(Huntsville, AL) – Today at the Mall of America in Bloomington, Minnesota, it was announced that Huntsville will have the honor of hosting the prestigious 2017 TBEX North America conference. TBEX (an acronym for Travel Blog Exchange) is the world’s largest conference for travel bloggers, journalists, online content curators, and other industry professionals. Hosting an event of this magnitude will not only bring a positive impact on the local economy, but a level of exposure that is extremely beneficial for Madison County, North Alabama, and the state of Alabama as a whole. By serving as the host city, the amount of digital publicity Huntsville/Madison County will receive through various social media channels and other online platforms is exponential. The TBEX community reaches over 300 million consumers across the globe, with a targeted audience of travelers and destination tourists. Conference-goers will take their experiences with the host city’s restaurants, museums, attractions, and more and use those ventures as content to publish on their respective mediums, many of which individually garner viewers or readers by the thousands. “We are thrilled to host the 2017 TBEX North America conference. We know social media has a huge impact in today’s world, and this is a magnificent opportunity to showcase all the outstanding things Huntsville has to offer to a global audience,” says Judy Ryals, President/CEO for the Huntsville/Madison County Convention & Visitors Bureau. TBEX began in 2009 and has since grown to be the largest conference of its kind, with each event drawing around 600-1,000 attendees from around the globe. These attendees are among some of the most influential names in their professions, which range from blogging and photography to radio hosting and internet video production. Although a majority of TBEX North America attendees are typically North American, a sizeable percentage of conference goers arrive from Europe and Asia as well. Countries represented in past TBEX North America conferences include France, Germany, Australia, Thailand, Brazil, and many others. 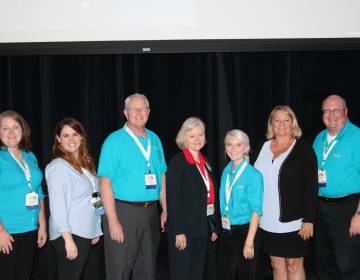 Huntsville made a strong showing at the 2016 TBEX North America conference this week in Bloomington, MN, with representatives from the Huntsville/Madison County CVB, the U.S. Space & Rocket Center, and the Von Braun Center in attendance for the exciting announcement. The U.S. Space & Rocket Center will be one of the Huntsville attractions offering special TBEX 2017 activities. “We’re looking forward to energizing TBEX attendees with the spirit of the Rocket City, the city that sent man to the moon,” says Dr. Deborah Barnhart, CEO and Executive Director of Rocket Center. It’s not just major attractions that stand to benefit from all the TBEX hype, however. Conference attendees like to immerse themselves in the local culture as much as possible, and that means visiting mom and pop shops, craft breweries, restaurants, and other small businesses that are uniquely Huntsville and Madison County. Doug Smith, Owner of A.M. Booth’s Lumberyard, says, “Seasoned travelers know how to find the best places, so when TBEX chose Huntsville, it came as an endorsement of our community, including our tourism community full of great ideas and motivated to make our city shine." Keeping with the theme of digital communication, the CVB has prepared a blog titled “Dear TBEX: In Huntsville, We Write” as a welcome mat of sorts for 2017 conference attendees. Those interested in joining the 2017 TBEX North America social media buzz can do so by using the hashtags #TBEX and #iHeartHsv. The announcement this morning was accompanied by a video created by local studio, Media Fusion, Inc., designed to give 2016 attendees a preview of what they can expect to experience in the Rocket City. The link to this video can be found here. To learn more, contact Kristen Pepper, Huntsville/Madison County CVB Marketing Manager at 256.874.0583 or kristen@huntsville.org.